What are the Results of LASIK Eye Surgery Today? LASIK eye surgery results have continued to improve since it was FDA approved in 1996. LASIK eye surgery offers many benefits and should significantly improve your overall quality of life. Due to the latest technology, surgeon’s skill and experience, almost ten million Americans are less dependent on their contact lenses and glasses. Today, most patients achieve 20/20 vision after LASIK eye surgery, but results are not the same for everyone. Some patients may achieve only 20/40 vision results or less. In some cases, patients may still need to wear glasses or contact lenses following LASIK eye surgery, however the post-operative prescription and visual acuity level will typically be much lower than before LASIK. The surgery has an excellent safety record, but like any surgery post-operative complications can occur. A very small percentage of patients may require an enhancement or touch up procedure to improve the vision to the desired level. Due to presbyopia, some LASIK eye surgery patients may still need reading glasses once you reach your mid-life (40 to 50) due to a normal age related loss of near vision. Overall, LASIK eye surgery has a very high success rate, but it is important that you discuss and consider all the risks with your surgeon prior to having LASIK eye surgery. What is LASIK Surgery Cornea Reshaping? What is LASIK and how long does LASIK last? LASIK eye surgery is a permanent procedure that corrects vision problems such as nearsightedness, farsightedness and astigmatism. The LASIK procedure involves using an excimer laser (a cool beam of light) to reshape the cornea in order to decrease or eliminate the need for glasses or contact lenses. Normally, your cornea (front part of the eye) focuses light onto the retina (back part of the eye) to create an image. If the cornea is imperfectly shaped or if the eyeball is longer or shorter than normal, a distorted image is projected onto the retina resulting in blurry vision. For many years the only solution to this problem was corrective eyewear. The LASIK procedure has a remarkable success rate, with 96% of patients achieving 20/20 vision or better, according to the American Society of Cataract and Refractive Surgery. 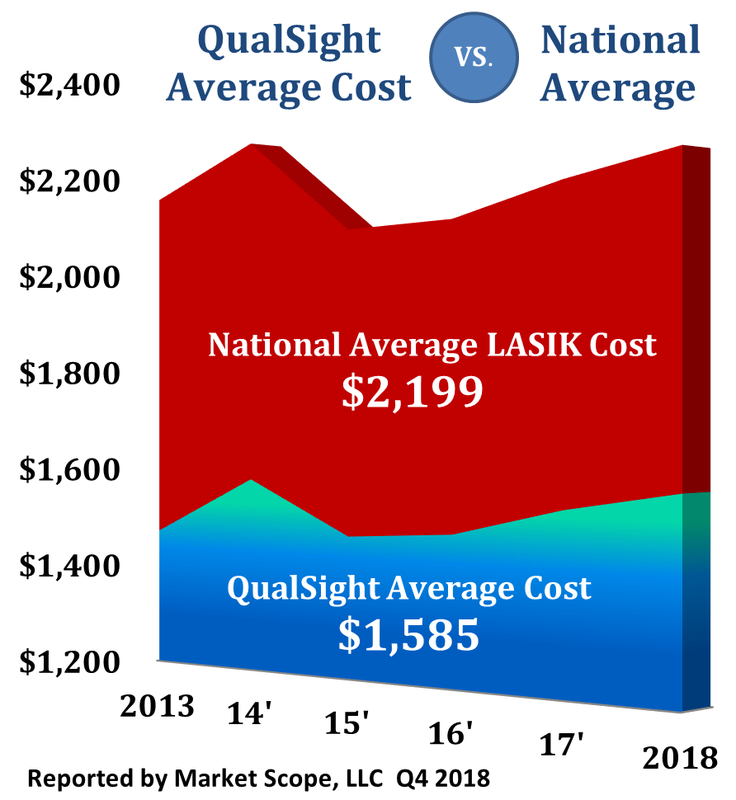 QualSight has set contracted pricing with doctors across the USA so we save our members on average over $700 per eye off the average LASIK eye surgery cost.